Antonio Rosetti was born in the north Bohemian town of Litomerice and initially studied to be a priest. Starting in 1774, he became a servant and double bass player for Prince Kraft Ernst of Oettingen-Wallerstein. Of magnanimous personality, the Prince allowed Rosetti to travel to Paris in 1781 to further his compositional desires. Rosetti made the most of his residence in Paris, and his works began to be known throughout Europe. In 1789, Rosetti was given the post of Kapellmeister to the Duke of Mecklenburg-Schwerin at the court in Ludwigslust. During this employment, Rosetti died at the young age of 42. Rosetti�s legacy includes 43 symphonies, over 70 concerti, and numerous chamber, keyboard and vocal pieces. His reputation may be of obscure proportions, but there are currently 13 discs on the market devoted exclusively to his music. The CPO label has been the champion of Rosetti�s music with 6 recordings, but Chandos and Naxos have also advanced his cause. Although I am not familiar with the recording, Supraphon has a disc of these same Harp Sonatas performed by Katerina Englichova. Of course, the Arte Nova disc is much less costly than the Supraphon. One of the revelations that came Rosetti�s way while in Paris was the great popularity of the harp. There was high demand from musicians for new harp compositions, and Rosetti was at the ready to help fill the void. However, Rosetti did not originally intend the Sonatas on this Arte Nova disc to be for unaccompanied harp, but for keyboard with accompanying violin. Since the primary role for the violin in Rosetti�s Sonatas is to double the upper line of the keyboard or harp, its absence does not damage the structural integrity of the music. Before moving on to the performances of the Harp Sonatas, I should report that Rosetti did not write profound music. Giving his works devoted concentration is not likely to be rewarding, as they offer little that is thought-provoking or enlightening. Whether it�s a Harp Sonata, Symphony or String Quartet, Rosetti is best listened to while engaged in other activities. 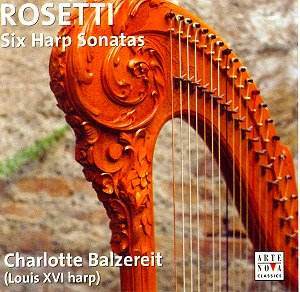 Having said the above, the Rosetti disc at hand presents delightful music lovingly played by Charlotte Balzereit on a copy of a Louis XVI Harp. This single-action pedal harp has a gorgeous tone with perfect resonance, and Balzereit gives me the impression that she is enjoying her performances immensely. As for the Sonatas themselves, each has three short movements with attractive themes that are only partially developed. I think it would be fair to say that the pieces are rather simple in conception and do not stray far from the world of pleasant moods. I have mixed feelings about the disc. Although it is so easy to forget this music after playing it, I can certainly envision its appeal in the right environment such as a candlelit dinner with a loved one. Essentially, the pieces represents the best that background music can offer. I also recommend the recording to harp enthusiasts who should definitely be impressed with the instrument played by Balzereit. Rosetti�s Harp Sonatas, although lacking diversity and depth, could be the perfect touch to a romantic interlude.